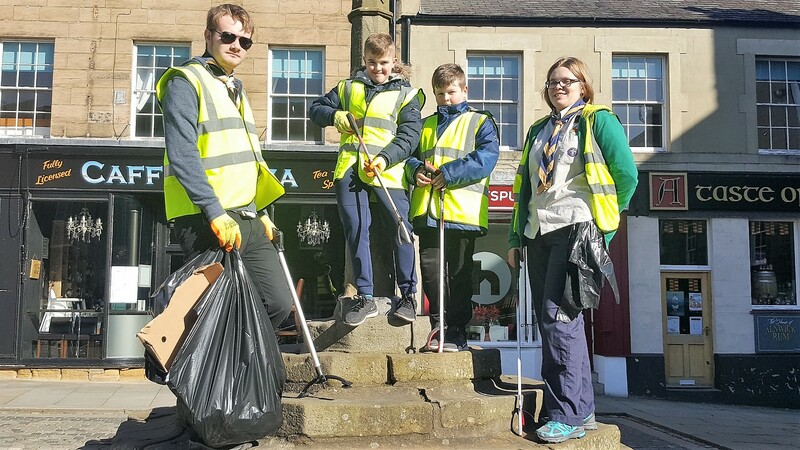 Saturday 25th and Sunday 26th March were town tidy up days in Alnwick with around 40 people turning out to take part in this annual community event. Representatives from a wide range of organisations were involved including Alnwick in Bloom, Alnwick Chamber of Trade, Alnwick Civic Society, Alnwick Area Friends of the Earth, Alnwick Cubs & Scouts, Alnmouth Road Residents Association as well as Town Councillors, Officers and members of the public. The main focus was on key areas of the town including Alnwick Bus Station, Greenwell Lane, Column Field / Fisher Lane, Dispensary Street Car Park, the Market Place and Pottergate Gardens and involved litter picking, sweeping, weeding and general tidying. Staff from McDonald’s will also be undertaking a litter pick on Shilbottle Road in the coming weeks. Mayor Alan Symmonds said “it is gratifying to see people taking pride in their town and don’t mind lending a hand to get it ready for the many visitors who will make Alnwick their destination this year. It’s clear to see what can be achieved in a relatively short time and the town has certainly benefitted from its Spring clean. The Town Council would like to say a big thank you all those who took part in the tidy up which is a great way to get the town ready for the many visitors who will visit the town over the Easter period”.